Do not let your gothic style keep your ensemble from being practical. We are happy to provide a number of gothic handbags and gothic purses for carrying your daily necessities. 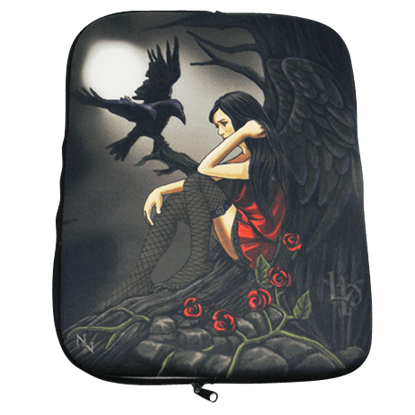 Our gothic satchels, messenger bags, laptop bags, tote bags, tablet cases, and wallets ensure that you will have an excellent variety of dark designs to choose from. Crafted from leather, canvas, and cloth, these high-quality gothic bags display detailed ornamentation ranging from graphic prints to their actual shapes. Choose a coffin-shaped purse for holding your cell phone and keys, or grab one of our Grim Reaper crossbody bags for your school books. Other items show off skulls, pentagrams, chains, crosses, ravens, fallen angels, and wolves, so you are sure to find something that appeals. These gothic backpacks and carry-alls include designs to suit men and women, so be sure to browse our selection to find your next bag! The image on the Black Bat Bag may be hard to see, but then bats tend to be hard to see at night. They use the cover of darkness to sneak up on their prey before they strike. Unleash your inner vampire with this iconic image. 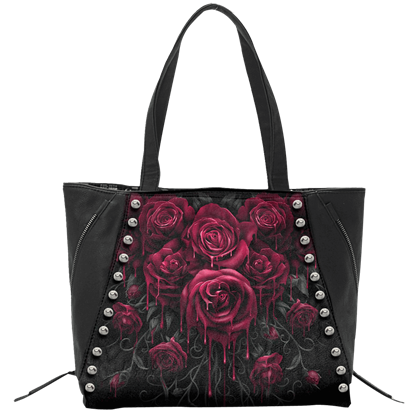 For a unique way to integrate a floral design, the Blood Rose Tote Bag is a functional accessory that will add style to every wardrobe. The delicate roses of the graphic drip with gothic style as they are saturated seamlessly in blood. No matter what age, the Bright Eyes Backpack is an excellent way to keep your essentials protected and organized. 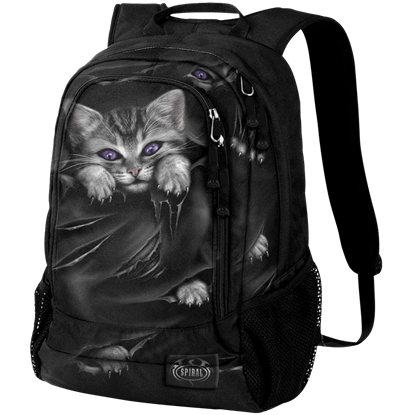 With easy open pockets, this gothic bookbag provides ample storage for many essentials, be it school or recreation. 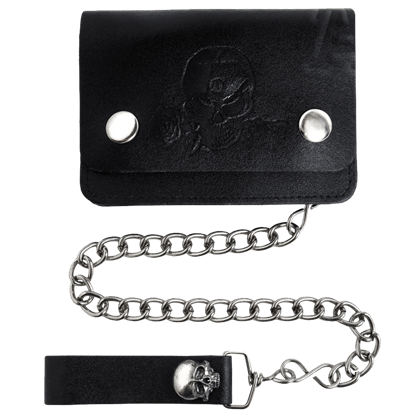 Practicality makes this wallet a great addition to anyones attire, while the subtle touches of design ensure that this Chained Alchemist Biker Wallet still has enough artistic detail to make an impression on all those who might see it. Soft black leather purse or cigarette case, with zipped side opening. 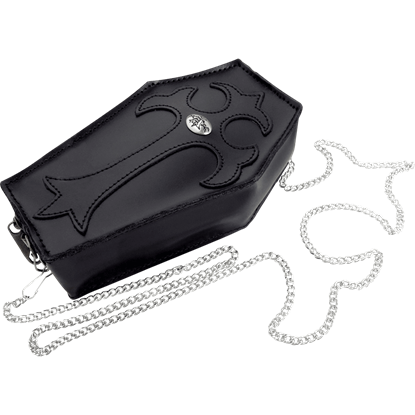 The Coffin Purse features a zipped side opening on a 15 inch curb chain. The coffin purse measures 6 inches high, 4 inches wide, and 2 inches deep. This coffin is quite luxurious, being made in high quality leather, with large bank-note section, several card pockets and eyelet hole for chain attachment. 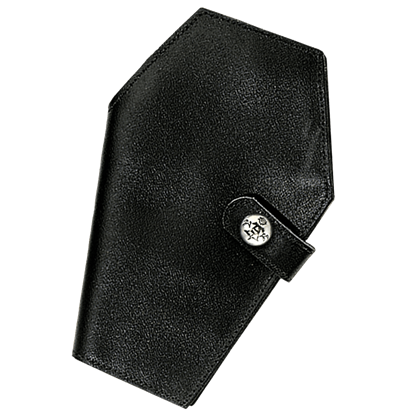 This leather Coffin Wallet measures 6 inches high and 4 inches wide. Its wings beat down, propelling it forward through the air. The leathery membranes of the dragons wings ripple as they repeatedly fill with air and empty again. 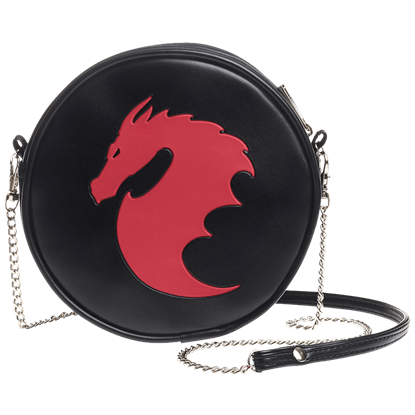 This is the image that comes to mind when viewing the Dragon Bag. Having a hard time presenting intense gothic style while carrying all your essentials? 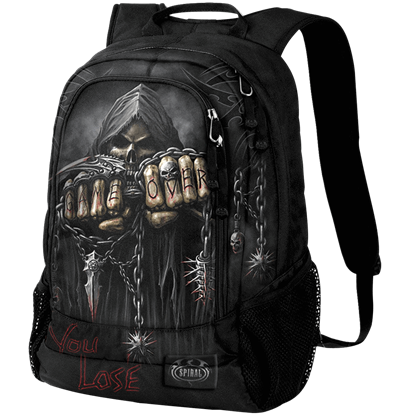 Your troubles are over with the Game Over Backpack! 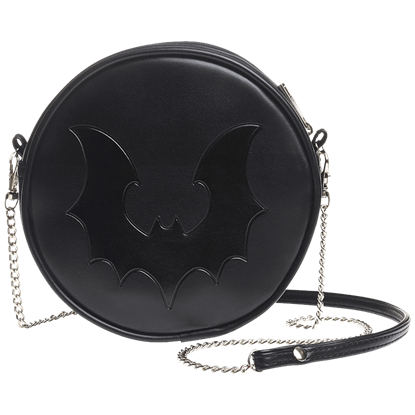 With its unmistakable gothic graphics, this gothic bag is ideal for every situation. In many of its shapes and forms, the cross has become an iconic symbol of the Gothic style. 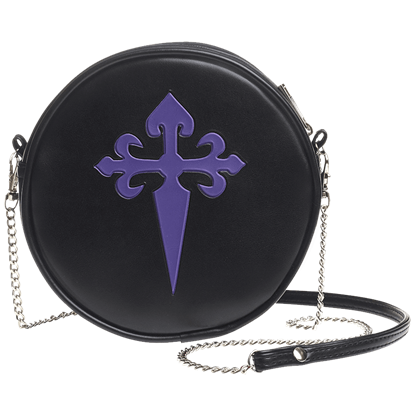 This may be because of the hatred vampires hold for crosses, or it could very well be because of this boldly stylish Gothic Cross Bag! Keep all of your necessities close at hand during your daily activities with the help of this striking brocade purse. 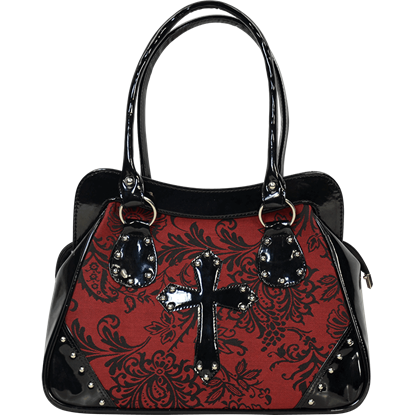 The Gothic Cross Handbag features a black patent leather cross motif with flat stud detailing along one side. 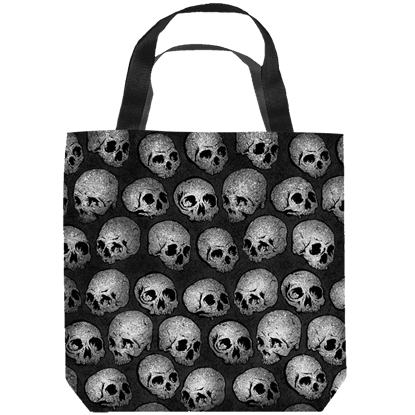 Bring your love of skulls with you everywhere you go with the help of this Gray Skull Tote Bag! Now you can add a ghoulish touch to any ensemble in an instant while also carrying practically anything you need in this convenient bag.